Camping Trip to Leeman, WA. A happy kayaker at sunset on Leeman Beach. Getting out of Perth for long weekends is every camper and adventurers dream. We joined in on the mass exodus and headed for Leeman Caravan Park. 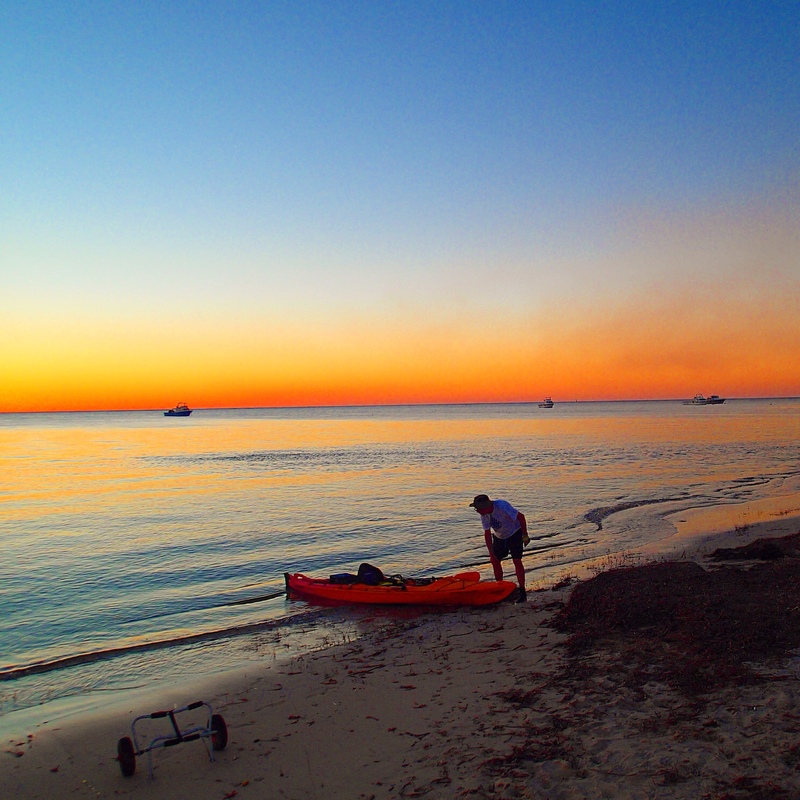 Leeman is a peaceful quaint cray-fishing town just north of Jurien Bay, best described as a slice of small town heaven. Leaving on Saturday lunch time we made our way up the freeway and out of the hustle and bustle. It wasn’t long before we had entered a more calmer open road. We had missed the peak of the traffic and made the most of little pit stops along the way. I normally head south for long weekends but it seemed like everyone else had the same idea; plus I was more interested in going somewhere a little warmer for autumn. After calling a few other booked out caravan parks, I came across a smaller place on recommendation called Leeman. A seaside town, Leeman is just under 300km north of Perth. It seemed everyone was going to Jurien, so it was nice to find a quieter but equally pretty oasis. I made friends quickly and chatted to our surrounding neighbours arrival. It was nice to hear their travelling stories. Most people were either up from Perth for the weekend, or on the circumnavigating Australia mission. Oh how I envied them! I have driven across Oz a few times myself, but my goal one day is to drive all the way around the outside. I am busting to see more of the outback and our natural wonders. Australia has such a diverse landscape and is so beautiful everywhere you go. I can’t wait until I can join the ‘grey nomads’ on their epic adventures. Beautiful sunset at Leeman Beach. After watching a calming sunset at the beach which was only 150m away from our quickly erected tents, we mosied into town for some dinner. Strangely not a lot was open for the lively time of 7pm for dinner, but we were in a very small town. After some hunting we found the local fish and chip shop to serve our hungry bellies; with very generous portions of chicken, tasty gravy and crisp healthy salad. I was very satisfied after a day of travelling a nice hot dinner was just what I needed. We walked past the jetty on the way back to camp, and stumbled across a number of keen kids and adults fishing away happily into the dark of night. As we looked into the clear glistening water, I saw two massive sting rays. I have never seen such massive ones before, over one metre in diameter, they hovered and glided stealthily around the jetty keeping us entertained. I got chatting to a few kids who were out to catch some fish. One boy was very friendly and knowledgable about travel, he had in fact driven all the way around Australia with his parents, twice! They were planning another trip soon, but this time he had to go to school and would fly over and meet his parents on school holidays. What a great life, what great parents; this kid would learn way more about life than he would being in school cooped up behind a desk everyday. Each trip would take about 6 months and they would spend most of their time in the northern part of Australia where it is warmer. Oh how I envied him! Add that to my bucket list! Another amazing thing about camping and being out of the city, is the beautiful display of stars in the night sky. I absolutely love stars and find it a real treat when the whole sky is full of them. It makes you realise how small we are and how big and uncharted our planet and universe really is. We did see some shooting stars too which was great. The next morning we played tennis at the local courts, which was heaps of fun. We then headed out to explore the surrounding towns and much to our delight there was so much to see! Greenhead was the first stop, and like its name, it was pretty green, and also pretty blue, my favourite colour! The must see place here is Dynamite Bay. A spectacular little stretch of white sand and crystal clear blue water. I had my gear off before you could say “wow check out this beach” and jumped right in. I am one of those crazy people that can swim all year around in freezing cold water, oh yeah, and loving it! The water was very refreshing and just what I needed after bashing balls on the tennis court. A few small stingers were my only complaint, but luckily I didn’t get stung by any. We ventured further down into Jurien Bay, the most popular of the three towns. Here we found some lunch then headed to the beach again. An attractive and well designed jetty heading off the beach gave us the opportunity to do some jetty jumping, which we did along side the many kids. So fun! I them swam right across the bay to the cement pylons were they have designed a snorkelling circuit. Fish are attracted to the man made reef providing a fun activity for snorkelers. I didn’t see any fish this time round, hopefully next time more reed and moss and fish have built up around it. On the last night we found time to relax at the campsite and enjoy the ambience and peace and quiet from being in the bush. Kids played football on the grass in the middle of the park, while the local bird life twittered, squawked and cackled their opinions as the daylight faded. By sunset we were on the beach in low lying beach chairs getting the best view for natures show of the setting sun. Again it didn’t disappoint, with lovely shades of pink and blue, colours glistening off the calm bay. Fishing boats in the harbour made for good props for my photo too. We headed down to fish again for one last time, my friend with his own fishing rod this time. It wasn’t long before we saw our new friends from the previous night and their friendly old pet ‘Red dog’. A replica of the dog from the aussie film, he was gentle and friendly and went from one person to another for pats and attention. Red dog showed a gentlemanly like quality, and seemed wise and gentle to me. I gave the lovely dog lots of affection, stroking his glossy dark red coat, mutually feeling happy by his show of unconditional love. Soon enough someone had pulled a squid onto the deck, and although I hated to see the little live animal suffer a deprived death, I did see a photo opportunity which I couldn’t resist. An awesome squid caught by a fisherman. I slept in my new swag that night, one I had bought that day from the local fishing & camping store called SeaSport in Jurien. The staff were very friendly and helpful making my big purchase an easy decision. Purple in colour, my new perfect little swag cocoon was only going to encourage me to camp more. Double rainbow kind of morning. I rose early on the final morning, to a very delightful bright rainbow in the sky. I grabbed my camera excitedly and jogged down to the beach for a better view. A nice way to wake up, only metres from the beach, Leeman is a great place to camp. With everything in walking distance, all necessities close by, and with many picturesque views, I highly recommend a trip to all the cute seaside towns heading north from Perth. After packing everything up quickly in the morning, we headed off for our return journey. First we stopped in at Jurien for some breakfast. A yummy spinach quieche from the local bakery satisfied me, then I was off to the beach again for one more refreshing salty swim. Again the water was ice cold but not long into the Antarctic like conditions, I got used to it and swam and floated around happily. The boys I travelled with were waiting for me in the car, not beach lovers like myself. I hopped aboard and we continued on our way back to Perth. We made one more stop on the way home, and boy was I glad we did. As the boys got their caffeine fixes, I ran up the grassy slopes barefoot excited to see the lookout at Ledge Beach. I was not disappointed, aqua blue water and bleached white sand made for one more special photo opportunity. Final view at Ledge beach lookout. Before you knew it we were back in the city again, another magic weekend getaway complete. After being in the bush and breathing in the fresh seaside air, I felt refreshed and happy, and ready to have a satisfied rest. I know I will return to these beautiful beachside small towns namely Ledge, Jurien, Green Head and Leeman. Why not go there for your next weekend away? I highly recommend all of them. Jump and your car and drive only a few short hours from the city, you won’t be disappointed, satisfaction guaranteed! I hope you enjoyed reading about my weekend camping trip away. Please comment or like my blog and feel free to share my article with your community. ‘Give a man a fish and you feed him for a day; teach a man to fish and you feed him for a lifetime.’ – Maimonides. Sounds like you had a lovely weekend away Anita! I just love that stretch of coastline. When I was a kid we had a beach shack at Wedge Island and would spend every summer out there. I miss those days! ← The Ugly Truth About Smoking.